I stopped wearing a watch when I was a nurse. You heard me. A nurse who counts pulses and respirations without a watch. Here’s the thing: I figured out I have a knack for timing. I realized, when counting breaths and heart rate, that I always looked at the second hand at precisely the moment it touched twelve again–exactly sixty seconds later. Tested it hundreds of times. One day I quit wearing a watch and started measuring vital statistics by listening to my gut. Fortunately, as I was mostly an administrator, I wasn’t often called on to take vitals. Along this same line of thinking, I used to try to train myself to sense who was calling when the phone rang. A Shawnee man once recommended it. Training my intuition. It worked pretty well. I simply lowered focus to that place in the body where qi is supposed to be centered, in the vicinity of the solar plexus, and see whose name came to mind. I’d say I reached the point of being 70% accurate, and I began to think of watches as problematic. If we humans are capable of intuiting the passing of time precisely, then watches might as well be declared obsolete. They’re holding us back from our own potential. Enter the era of cell phones and texting, which Phil and I both refuse to buy into. Now we go days without incoming calls, and when the telephone does ring, we check caller ID. Still, that tendency toward the intuitive mostly serves me well. It’s when I don’t pay attention to it that I get into trouble. Intuition completely failed me last week. I had no idea my review copies would show up as soon as they did, but Friday night on our doorstep, there they were. Opening a box full of your brand-new book puts you into the realm of disbelief for a period of time. I’ve noticed it almost gets worse with each new book. What is that? A feeling—once was a fluke, twice was an accident, but three times, four times? Now seven? Whatever came over me took until last night to pass. Finally I was able to open the box, pick up a book, walk into the kitchen and pore over it. While Phil very quietly and sweetly got dinner. First off, I need the world to know that this book would never have been more than a ridiculous arrangement of words on many pages without my friend Nancy Casey. Nancy has devotedly read almost all of my work in its very early stages, although I don’t really know how she can stand to do so. The book went around to a few publishers and eventually found its way to Booktrope, where most of my previous books had also found a very good home and very good company. Skip down the road a few years to where Nancy became an editor and proofreader for Booktrope and the vectors lined up so that she was the editor for Jagged Edge of the Sky. Her work on the book took it from being an entity with its own very jagged edges to the relatively precise and many-tunneled experience that it is. It would not be any place as close to as good a book if not for the hand and eye of Nancy directing me. I also have to draw attention to our proofreader, Vicki Sly, who also narrated the book’s trailer. Vicki was in addition our fact-checker and, as she is from Western Australian herself, was able to give thumbs up on the details I got right and point out the ones that needed tweaking. It was such a pleasure working with her, and I was completely humbled when she agreed to narrate the trailer as she is very busy and quite in demand as an editor and proofreader who has worked widely in Australia. Also, once again I find myself singing praises for Booktrope’s Greg Simanson. Jagged Edge of the Sky is the fifth of my books that he’s designed, and we are to the point where he just looks at my title and rolls out the right cover. It’s not quite that way, but you get the idea. In this case, my book’s marketing manager, Lisa Nicolle Young, Nancy Casey, and I went back and forth a number of times trying to decide between Greg’s concepts. In the end we chose the very first design he presented, and the simplest one. His initial instinct was right. Lastly, I have to give enormous credit to Lisa Nicolle Young. She has been working with me for for about a year and a half as my marketing manager at Booktrope and brings immense understanding of what it takes to market a creative product. I admire her background and her current work very much and worry every single day she’s going to decide she has better things to do. 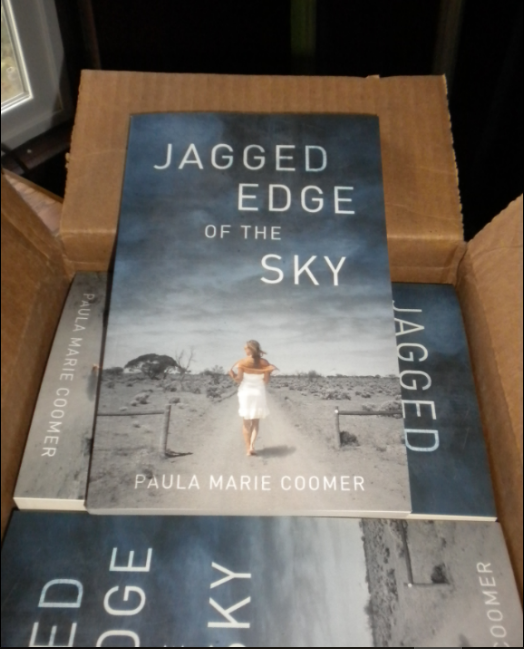 Jagged Edge of the Sky will only find its way into the hands of readers because of her talent and experience, and the fact that she’s in my corner, telling me what to do next. The birth of a book is like having a child. We’ve got a busy road ahead. Hope to see each of you somewhere along it!